Rated 2 out of 5 by jocasta1 from Swing and a myth! 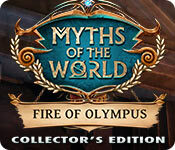 I have all the other Myths of the World games, and this is the first one I won't be buying. I'm not sure how you can make the Greek gods boring, but this game does it. It's slow, the mini games are more like interruptions than part of the flow of the game, and the characters are wooden. It also looks dated. i always look forward to a new game in this series, but this is, unfortunately, a thumbs down for me! Rated 2 out of 5 by sunnyglow from A GREEK TRAGEDY FOR EIPIX OVERVIEW: THE RISE AND FALL OF THE EIPIXIAN EMPIRE! At one time, this developer had the best games on the BFG site. I used to look forward to each new game! Nowadays, plagued by cookie cutter games lacking creativity along with stereotypical characters, this is not the case. One word describes this game for me – DREADFUL! I would rather be Prometheus bound to a stone, on fire with a bird eating my flesh than to continue playing this depressing and boring game. Perhaps it does get better after the demo; however, I don’t want to purchase it to find out. This game is another cookie cutter version of many others from this developer, lacking any originality nor creative effort! The gaming pace is slower than the turtle from Aesop’s Fables. There is a great deal of back-and-forth movement within the game with boring repetitive actions and the same HOP scenes and puzzles seen in all their games. One of the puzzles is lacking sufficient directions to solve it. The musical accompaniment with chanting was so irritating to me, I finally turned it off! You get a gimmicky orb which turns items and people into ice cubes. You collect omega signs. This is the same game you have seen a dozen times before. I still hold out hope! Hopefully, we will see much better offerings in the future! Like the Ancient Greeks, perhaps EIPIX will reflect upon its past successes and regain some its former glory. Also, hopefully, we will see them sailing away from Europe for some new ideas for those “Myths of the World,” not “Myths of Europe.” Again, this is my opinion of this game. For those who enjoy it – I am happy for you! Enjoy! STORY: Grab your toga and get ready to battle the gods of Ancient Greece! Play Lysandra, Goddess of the Eternal Frost. Your father, Prometheus, stole fire from Mt. Olympus is now being held by the gods for treason. As punishment, Zeus has chained your father to a rock at the end of the world, setting him on fire, with a bird slowly pecking away his flesh. As a dutiful daughter, you are off to save him; however, that won’t be easy as Zeus has removed your godly powers. Your father, however, gives you an orb which allows you to return to Ancient Greece to get help from the Oracle of Delphi. Go through the orb and return to Ancient Greece. Be careful in your Hellenic journey – you are now mortal! HOP SCENES: Expecting some new creative scenes? Well, you won’t find them in this game. 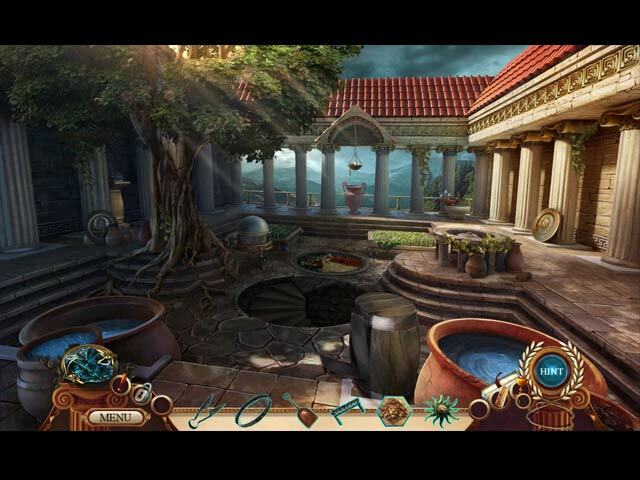 Going back to the ancient past has also inspired EIPIX to resurrect their now ancient HOP scene in which you locate five of one items which just happens to open a list of items to locate. To create that truly Hellenic feel, EIPIX provides a scene in which you look for Greek letters. There are the usual cryptic, silhouette and storybook scenes. You can also play the same old skipping stones game in lieu of the HOP scene. PUZZLES: The puzzles are all easy! There is an assembly puzzle creating circles, a logic puzzle with the same design as a nonogram puzzle. Again, you can bound up ledges by choosing the correct stones to break your fall. There is a LESS than “a-maze-ing” maze puzzle in which you move triangles to align with each other. Become a pinball wizard with a modified pinball machine. There are also a rotating tiles puzzle and a sequence puzzle to lull a snake to sleep. (And it worked – it put me to sleep as well) EIPIX – YOUR SLIP (UP) IS SHOWING: Please EIPIX! Your “slip-ups are showing” within the puzzles. Please provide better details on solving the puzzles. This is NOT the first game which I found the directions lacking in detail. LEVELS: Mortal, Hero, Demigod, Olympian Hint: 10 to 120 seconds Skips: 10 to 400 seconds EXTRAS: Map is provided as you play the game You get special power to zap items into ice as indicated by a handy dandy orb on your inventory bar. 12 Achievements – Some with 3 parts Collect 38 Omega Signs Replay 9 HOP scenes and 20 puzzles 8 Wallpapers, 2 Concept Art, Video, Music, Souvenir Room, Skipping Stones HERE ARE THE DETAILS (SPOILERS) FOR THOSE WANT MORE INFORMATION ON THE HOP SCENES AND PUZZLES IN SEQUENCE HOP SCENES: You can play a skipping stones game in lieu of the scenes. (A) Multiple-step. (1) Locate 5 spearheads. (2) List of items. (B) Multiple-step. (1) Cryptic clues. (2) List of items. 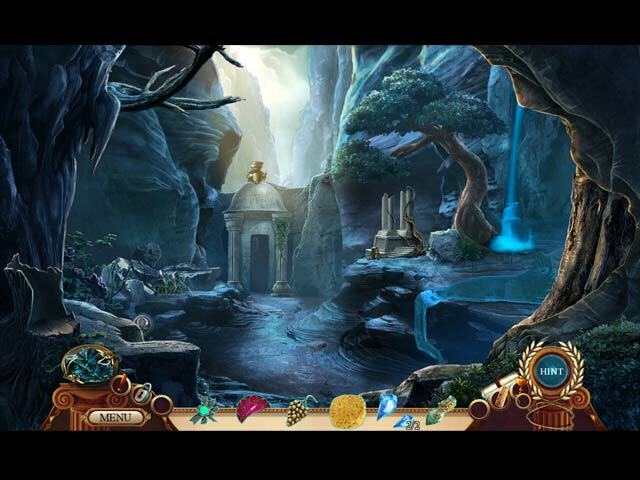 (C) Good ole EIPIX HOP scene seen in EVERY game (1) First locate 5 each of two types of items. (2) Each one opens a list of items. (D) Silhouette. (1) Look for Greek letters. (2) List of items. (E) Storybook. Items listed in BOLD letters. PUZZLES: They are all easy A. Assembly puzzle. Move segments of two symbols until they create two circles. Is this truly a puzzle? B. Logic puzzle. Based on nonogram puzzles. Place tokens into a grid so that the tokens match up with the numbers given on each side. C. Physical puzzle. Go down a ledge choosing the correct stones to break your fall. D. Maze puzzle. Move blue triangles so they interconnect. I found this puzzle confusing. Directions not explicit. E. Geometric puzzle. In a modified pinball “machine,” move a ball to a hole by creating a path moving bars to angle them so they hit their mark. 2X F. Rotating Tiles puzzle. Rotate tiles to restore a picture. G. Logic/Sequence puzzle. Play the proper strings on a lyre to lull a snake to sleep. Figure out the sequence by figuring out the logic behind the sequence. H. Same as G but with two more strings in the lyre. Rated 1 out of 5 by bocelt11 from not fun did not like. couldn't even get into it. Rated 1 out of 5 by codom from Why? This game is just a mess. It's a rare feat to have a game where there's almost nothing good to say about it. Poor graphics, easy puzzles and HOPs and just an overall boring story sum up this disaster. Rated 1 out of 5 by Granny_Gruff from Dear Eipix, Please Stop! Another game has arrived from Eipix. Once again, I am underwhelmed by the story and the game play. This new entry in the Myths of the World series is a fractured take on the story of Prometheus. Good news: It is a game. Bad news: the story is unsuccessful, the game play is similar to all the recent Eipix games, the HOPs and minigames are unoriginal, and the over all pace of the game is glacial. Please try the demo for yourself. Perhaps you will not be as disappointed as I was! Rated 1 out of 5 by tillybaby from Sleep inducing This game is so boring and has been done so many times before. In fact I suffered the game until nearly the end of my demo time but nearly fell asleep so deleted it while still gameplay remaining, unheard of in the past. Rated 1 out of 5 by LunaNik from This game mythed the mark. Review based on: full demo Overall rating: ? What my rating means: I struggled to get through the demo. SHORT & SWEET SUMMARY REVIEW Another silly storyline having nothing to do with the original myth. Dated, boring, and simplistic gameplay we’ve seen a million times. This isn’t remotely a five-star game. Eipix should be embarrassed to put their name on it. More details on the specific elements of the game below the fold… ———————————————————— STORYLINE ANALYSIS Prometheus has stolen fire from the gods and given it to humans. His punishment is to be chained to a rock at the end of the world. And that’s where the similarity between this game and Greek mythology ends. Eipix has invented a daughter of Prometheus, Lysander, goddess of the eternal frost, to attempt to save Prometheus from the sanitized fate they’ve written for him. Eipix’s fabricated version of the Prometheus myth leaves much to be desired. It’s an unnecessarily convoluted storyline that moves much too slowly, with subplots that are shallow, almost after thoughts. I wish Eipix would work within the context of the original myths, because they’re fascinating and much better than these made-up, airbrushed versions. GAMEPLAY ANALYSIS Eipix has taken a marathon’s worth of steps backward in gameplay here. Exploration is largely running back and forth finding and using shaped keys ad nauseum, many of them in groups of two or three. This gets old fast. One throwaway zoom scene had several jars. Open one with a shaped key, and find another. Keep doing this to finally get the item in the last jar. Honestly, who thinks this is fun? 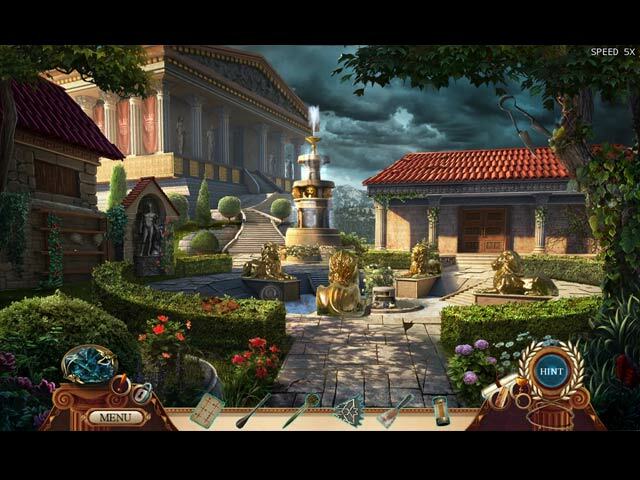 HO scenes were all unhidden object scenes, and presented in limited variation, mostly not very creative. Minimally interactive list, silhouette, capitalized words in a narrative, symbols, five of each to open list panels, mini-zoom multiples of one item. All easy, since the objects were in plain sight. You can play “skipping stones” instead. Puzzles were neither innovative nor challenging. • Eternal Frost (repeating) - Make connecting paths between the blue triangles by moving the blue tokens. Red tokens are stationary. • Attack Zeus - To aim the spear, click and drag until the symbols align. Two levels. • Nonogrid - Place the tokens in the grid according to the numbers in the rows and columns. • Rock Climber - Descend the cliff by choosing the correct rocks. • Pinball Wizard - Move the deflectors to create a path for the ball to the hole. Two levels. • Jigsaw - Rotate the tiles to restore the image. • Lyre, Lyre - Solve the logic puzzle to play the correct melody on the lyre. Two levels. • Patterns - Rotate the circles and rings to match up the patterns. • Soul Music - Connect the lines without using the same path twice. DESIGN & PRODUCTION Eipix’s usual top-notch graphics, animation, music, and sound. They’d be better at movies than games, since they keep offering the same tired storylines and same unhidden object scenes and easy puzzles over and over again. EXTRAS Bonus chapter, strategy guide, performance achievements. Collectible signs that are very easy to spot. Replayable HO scenes and puzzles, plus the “skipping stones” game and a souvenir room. The portfolio includes wallpapers, videos, concept art, and soundtracks. CONCLUSION I found this game incredibly boring, and struggled just to finish the demo. The storyline moved slowly, yet was convoluted. The gameplay was repetitive and far too easy. IMO, this represents a huge myth-step for Eipix.